Buon giorno and welcome to Stefano’s RomeCabs, Rome’s leading company for private tours, transfers, and driver services in Rome and to top destinations in Italy. As we receive many requests to visit Etruscan places in Central Italy, we included 7 amazing places to visit on your Etruscan tours in Italy. A number of the Etruscan places included are also featured in some of our day tours from Rome. Others are also possible to visit on day trips from Rome by car. By far the most popular Etruscan places in central Italy that most travelers visit on their Etruscan tours are the Banditaccia Etruscan Necropolis in Cerveteri and Monterozzi Etruscan Necropolis in Tarquinia. Each one is very unique and unlike any other necropolis in Italy. About 3,000 years ago, Cerveteri was one of the primary city states of the Etruscan League known as Cisra Caere. By 600 BC it reached the peak of its power and status as one of the main Etruscan trading centers. However, during the Roman expansion, Cisra Caere was defeated by the Romans in 3rd century BC and by the 1st century BC it ceased to exist as it was absorbed into the Roman culture and society. All that is left to know about this ancient Etruscan city and its population has been discovered within the tombs of the city of the dead known as Necropolis. The necropolis was always away from the Acropolis (the main city). Cerveteri’s ancient Etruscan necropolis is a 25 acre archaeological site with about 1,000 tombs from the early days of the Etruscan era of 9th century BC to the end of the Etruscan civilization in the 3rd century BC. The tombs you’ll see differ in size and style depending on the period of time, family status, and various other criteria. Some such ancient “roads” are Via dei Monti Ceriti and the Via dei Monti della Tolfa that go back back to to around 6th century BC. The interiors of these ancient tombs of the elite who could afford elaborate tombs represent the house of the deceased. The ancient tomb builders carved into the tuffa rock not only a singular tomb to house the deceased, but also added corridors, central hallways, multiple rooms for families to be buried together, gabled roofs that imitated actual homes, furniture such as beds and chairs carved out of the stone, and a variety of decorative details such as moldings and columns. Considered to be the permanent homes of the deceased, many of the tombs inside the necropolis are exceptionally significant for being among the very few examples of Etruscan residential architecture since the Etruscans built their actual homes out of wood and clay which have perished over time. From around 8th century BC, Tarquinia grew to become the most significant city of the 12 Etruscan city states that made up the Etruscan League, and also produced at least one Etruscan king that ruled Rome before Rome became a Republic. In the modern times, Tarquinia is still famous for the impressive painted tombs inside the Monterozzi Necropolis situated on the outskirts of the main city. Monterozzi Necropolis (along with Banditaccia Necropolis in Cerveteri) is a UNESCO World Heritage Site. Although more than 6000 tombs were discovered in this necropolis outside of Tarquinia, about 150 of them are exceptionally unique as they were beautifully painted with frescoes depicting everyday activities of the Etruscans and the life of the deceased who occupied the tomb. Unlike Cerveteri where you meander through the park-like setting with mostly above ground tombs that you may enter into and explore, at the necropolis in Tarquinia most of the visitable tombs are underground and sealed off by a metal door with glass window in order to preserve the delicate 2,500 year old frescoes inside the tomb in an climate controlled environment. To visit each tomb, visitors must descend a flight of stairs. Next to the door is a button that temporarily turns on the light inside the tomb to allow you to see the beautiful frescoes inside. About a dozen tombs are open to visitors at a time, and as you descend underground you’ll discover vibrant and lively frescoes of these ancient people going about their lives enjoying banquets, playing musical instruments, drinking wine wine, playing sports, wearing fashionable garments and ornate jewelry, and generally pursuing happiness through all their senses. The burial chambers in this necropolis were also carved into rock and also represented the interior of actual houses of that time. During the peak of the Etruscan civilization the frescoes depicted happy times full of play and celebrations. However, during the decline of their civilization as city state after city state fell under the control of the ever expanding Romans, their tomb frescoes also took on a much darker tone with infernal demons and underground deities replacing the previous cheerful celebrations. If you wish see some of the incredible artifacts discovered inside these painted tombs, be sure to also visit Tarquinia’s National Museum inside in the Renaissance Palazzo Vitelleschi that houses some of the most significant Etruscan archaeological findings in Italy! The necropolis, along with the ruins of the Temple of Belvedere (located near the entrance of the city in the vicinity of St Patrick’s Well), are vestiges of the Etruscan civilization that for centuries inhabited Orvieto. At the of “Crocifisso del Tufo“ you will find several rectangular shaped tombs lined up like street shops with passageways separating the tombs like small city blocks. Each tomb has the family name carved onto the surface in Etruscan letters that are still visible. The grave goods discovered inside this necropolis are on display inside museums in Orvieto. Not far from Tarquinia between Vetralla and Viterbo where the ancient Roman road Via Clodia crossed and 3 rivers converged (Rivers Pile, Acqualta and Bedano), there was once an Etruscan settlement known as Orclae. Deep in the wild Roman countryside and hidden by untamed nature are the remains of the necropolis of Orclae that later became known as Norchia. 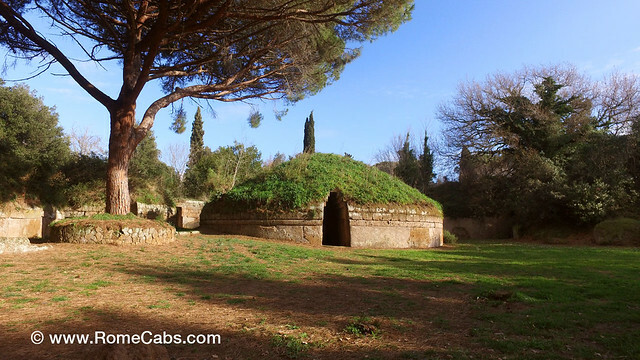 What makes this necropolis unique on your Etruscan tours is that the tombs are neither mounds or blocks like in Cerveteri and Orvieto, nor underground as in Tarquinia. Instead, the tombs that date from 6th-5th century BC and 4th-2nd century BC were carved directly into the tuffaceous cliffside. The deceased were placed inside stone sarcophagi inside these elevated tombs. The portico tombs enriched with various architectural elements that are still visible today, were accessed by stairs that were also carved onto the side of the cliff. While notable tombs have signs (such as the Prostila Tomb,the Smurinas Tomb, the Ciarlanti Tomb, and the Caronte Tomb), they are entirely in the wilderness, so visitors must always be careful and mind their steps to avoid tripping or falling, and to avoid damaging the fragile structures. Very comfortable shoes for hiking and walking on uneven terrain, as well as appropriate clothing is always recommended when venturing into the countryside wilderness. It also merits to mention that during the middle ages the area was inhabited, some tombs were used for shelter, and a castle and church were built on the opposite side of the ridge. The Medieval settlement was abandoned by the 14th century due to malaria, however the ruins of the church and castle are still visible and accessible on foot for those who enjoy the extra hike through the wooded area. In the southern Tuscan region of Sovana, Sorano and Pitigliano, you’ll find some amazing archaeological places inside that include the mysterious Etruscan “rock cut pathways” known in Italian as “Vie Cave” dug vertically through tuffaceous hills like deep trenches (sometimes even 60 feet high and more). Although the purpose for these winding evocative passageways are not clear and hypothesis are plenty, they also appear to connect the areas of the ancient acropolis (the city where people dwelled) to the necropolis (the cities of the dead). In the Archaeological Park near Sovana, not only you will find numerous Vie Cave, but also Tombs – such as the 3-2nd century BC monumental Etruscan temple known has the Ilderbranta Tomb. Tucked away in the heavily wooded area, the tomb was discovered in 1924 named after Pope Gregory VII, whose real name was Ildebrando Aldobrandeschi da Sovana. This significant tomb complex is entirely rock cut (carved into the tuffa rock without adding external materials) and decorated with floral and zoomorphic motifs. It includes a 12 column portico with coffered ceiling that rests on a podium, two adjacent staircases, and a funeral chamber. Reconstruction models indicates that the tomb was built in the style of a Greek temple, further underscoring the social and cultural ties between the ancient Greeks and Etruscans (both powerful and advanced civilizations of that time). The facade of the temple was covered with polychrome stucco, indication of the Etruscans’ love for bright colors. Tuffa rock was used to carve tombs as it’s a softer rock to carve into and ample in central Italy, unfortunately this beneficial characteristic of tuffa made the structures not very durable and the architectural details wore off and lost over time. Ildebranda Tomb unique and unlike other discovered elaborate Etruscan tombs. Your Etruscan tours are not complete without visiting another rare find that’s pretty much a hidden treasure: Tomb of the Infernal Chariot. In 2003, excavations in the Etruscan Necropolis of Pianacce near Sarteano discovered an extraordinary tomb 5 meters underground, with a 19 meter corridor and 4 niches. What makes this tomb momentous is its unusual pictorial cycle that is still in remarkable condition. The main scene of this monumental 4th-2nd century BC tomb carved into the local travertine rock, portrays a chariot pulled by 2 lions and 2 griffins (fantastical creatures that belong to an underworld mythical chariot) driven by the Etruscan demon known as Charun who carries the deceased into the afterlife or the underworld. The rendition of Charun is quite unusual: He is depicted with a fang sticking out of his lower jaw, wide demonic eyes, and flaming red hair that matches his red robe. The chariot includes details that reflect the advanced artistic skills of the painter. The second scene in the tomb depicts a funeral banquet with the 2 deceased men reclining on a traditional triclinium (dining room reclining bed) in a traditional greeting pose. It is interpreted that the older bearded male is the father (the owner of the tomb) welcoming his son who died at a young age to the underworld. In the deepest area of the burial chamber where the sarcophagus are, the painting on the wall depicts the quintessential monster that dwells in the underworld: an enormous serpent with 3 heads. Based on other similar pictorial depictions, Etruscans may have believed that they could possibly encounter such a monster on on their way into the underworld. Another mythical beast associated with the underworld depicted on the back wall is a large hippocamp: a sea creature that’s half horse and half fish that symbolizes the journey to the underworld. This marine passage from life to death is also depicted in paintings inside the tombs in Tarquinia as figures diving into the sea, and sea wave motifs. The sarcophagus in the back of the tomb that belongs to the owner of the tomb is remarkable as it’s made out of alabaster imported from (the current city of) Volterra, but worked on at the site of the tomb by local craftsmen possibly from Chiusi. In order to preserve the delicate and ancient frescoes, the visits to the tomb are limited for a brief period of time. Between October and May the tomb is open for visits on Saturday mornings at 11:30 a.m. Between June and September the tomb is open for visits on Saturday mornings at 9:30 a.m. , and then on Saturday evenings at 6:00 p.m. The Tomb has to be reached by private transport as it’s not accessible by public transport. We hope you’ve enjoyed this brief journey to 7 amazing places to visit on your Etruscan tours. If you wish to experience any of these amazing ancient places, you may either book the tours that include these sites, or send us an email with a request for a customized tour to your preferred Etruscan places. We look forward to showing you the best that Italy has to offer!